Ex-Chelsea World Cup winning Captain believes it's time for John Terry to leave. Having played just six minutes of Premier League football since mid-September, John Terry has been encouraged by Marcel Desailly to quit the club and move on. As featured on another blog post just posted on here, John Terry has spoken of spending his time on match days on the Chelsea bench and has stated that he hopes that he doesn't play again this season because that means the team keeps on winning games. In response and featured in a recent interview, the ex-Chelsea Captain and World Cup/European Championship winning defender Marcel Desailly has given his take on what John Terry needs to do and has highlighted the circumstances that forced him to make that decision back in the summer of 2004. It’s great to see that he’s been able to handle it. You are the captain, you have been put to the side a bit because other players are more suited for the tactics required, but you’re still there present, you are still there focused. You remind one of the players when he’s not training well “Oh, what are you doing?” so these are the small important details that John is going over. I’m happy because it’s a different phase for John – leader as a first-choice but also leader as a second-choice. He’s there to boost and to be present in the group so it’s a different approach of John." - Source: Daily Mail. 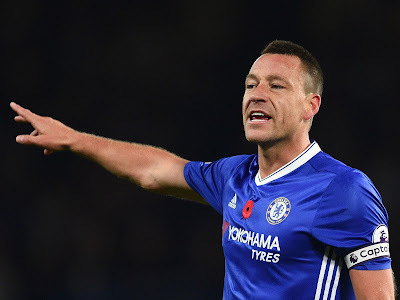 Now we know for a fact that John Terry remains as fit as a fiddle and has openly stated that he feels as though he has one or two more seasons left in him, with that ideally being at Chelsea. We have also often heard Antonio Conte talk of how important JT is in the dressing room and around the training ground as he remains our Captain. I just wonder if that will still be the case next season hoping personally that it is. You cannot buy experience and JT has it in abundance. What he doesn't give you playing he gives to the players and the Manager in a different way and it's proving to be just as effective. I disagree with Marcel Desailly stating that should call his time at Chelsea as over. Why go somewhere else to play but phase out a glorious career when you will hopefully have the chance to do that at the top?